Last spring I purchased a new Brother sewing machine because my dear old Bernina – after 14 years and over 10 million stitches – is just getting worn out. I looked at the new Berninas – they are beautiful – but decided on the Brother because it had a couple of features I really liked and seemed a little more cost effective. And here is a closeup of the touch screen, which makes selection of stitches, tension, etc. so easy. It even has tutorials for filling a bobbin, threading the machine, etc. 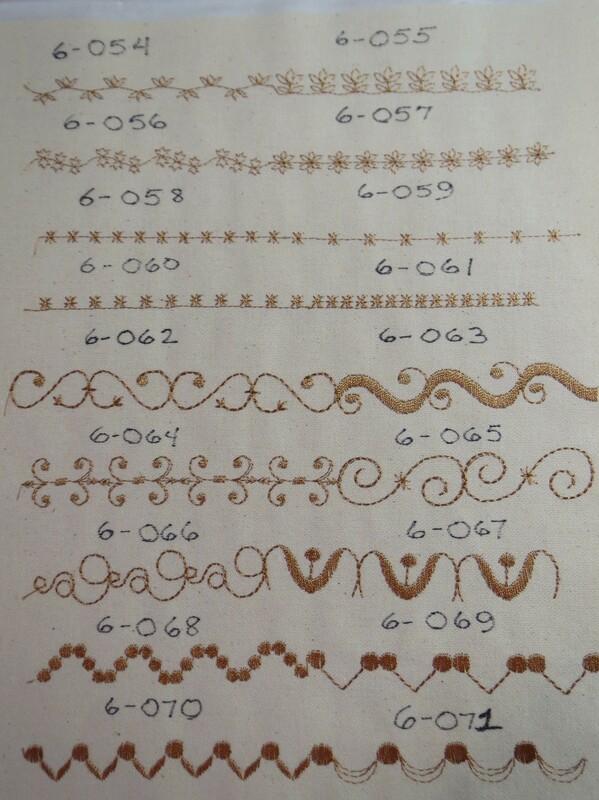 It has a beautiful selection of decorative stitches – here are a couple of pages where I stitched some out so I would have a reference book of all the stitches. 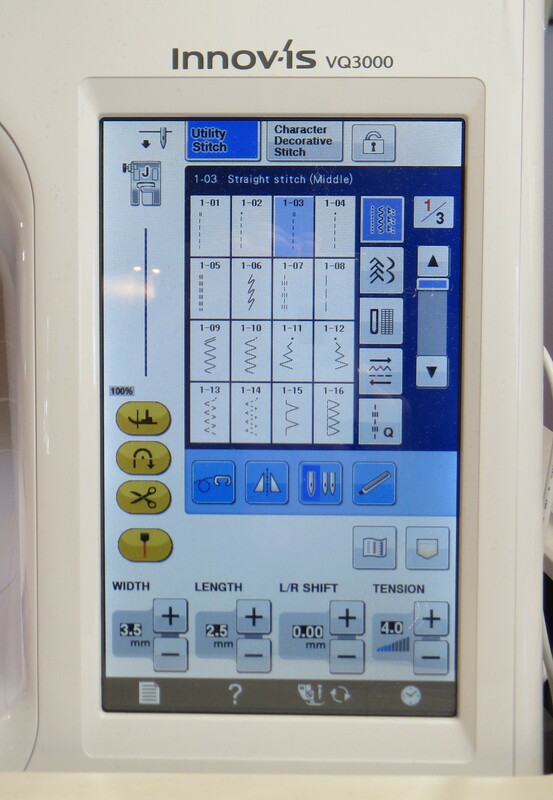 This machine even lets you design your own decorative stitches and save them in the machine, as well as download new stitches through a USB port. As with the rest of the machine, these features are straightforward and easy to do. The automatic needle threading works very well, as does the thread cutting feature when I use it (great for piecing with cotton thread and of course would be terrific for garment sewing, not so good for free motion quilting or work with specialty threads such as monofilament ). And the last feature I especially like is the excellent manual, which has very clear explanations about how to use the machine to accomplish various tasks. It is really well done. I took it to the print shop and had it spiral bound, since I know I will use it frequently. I am still developing my skills with this machine, and generally I like it very much. It has a couple of negatives compared to my old Bernina, but they are minor. They mostly have to do with the feet. Bernina presser feet are really quick to change – no screws required – and I miss that feature, especially when switching from a regular foot to the walking foot and back to a regular foot, which I do frequently. Of course the extra convenience of the Bernina feet means they are more expensive — always a trade-off! And I miss the Bernina walking foot, which seems to perform better with less noise. I am referring here to a “regular” type walking foot that I bought as an add on to the Brother; the Brother comes with a very unique walking foot intended for use with specialty fabrics. I haven’t even tried that foot out, because the sole is so wide and has such poor visibility that I know I won’t use it for quilting. The regular walking foot on the Brother works fine; I just don’t like it quite as well as the Bernina one. As I get better at using some of the special features of the Brother, I will post the results here. 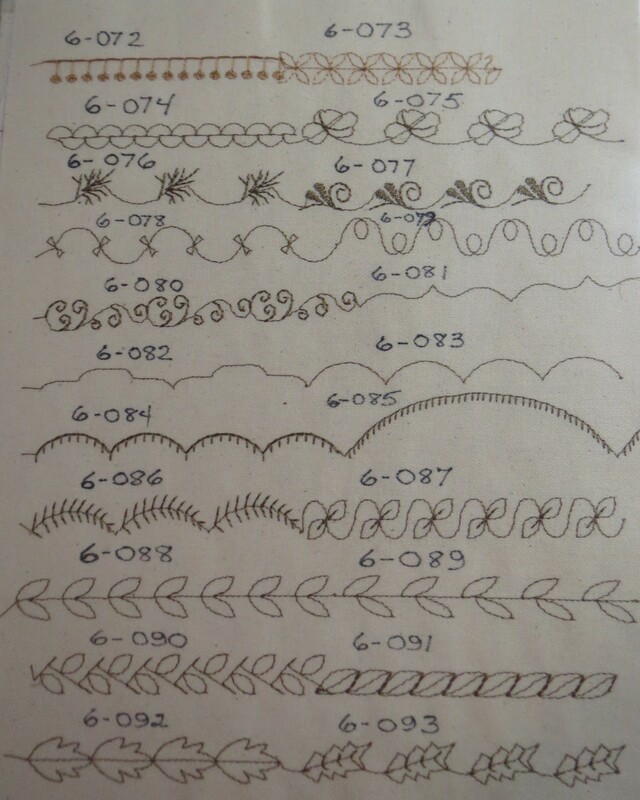 I especially want to do some stitch designs and see what new decorative stitches I can invent! 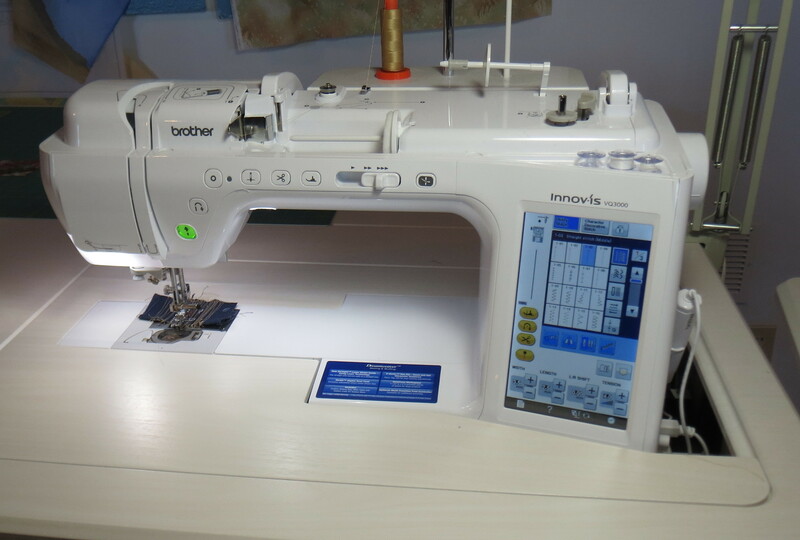 This entry was posted in sewing machine and tagged Brother sewing machines, dreamweaver, innovis 3000, sewing machine on November 4, 2014 by Shirley at Mystery Bay Quilt Design.